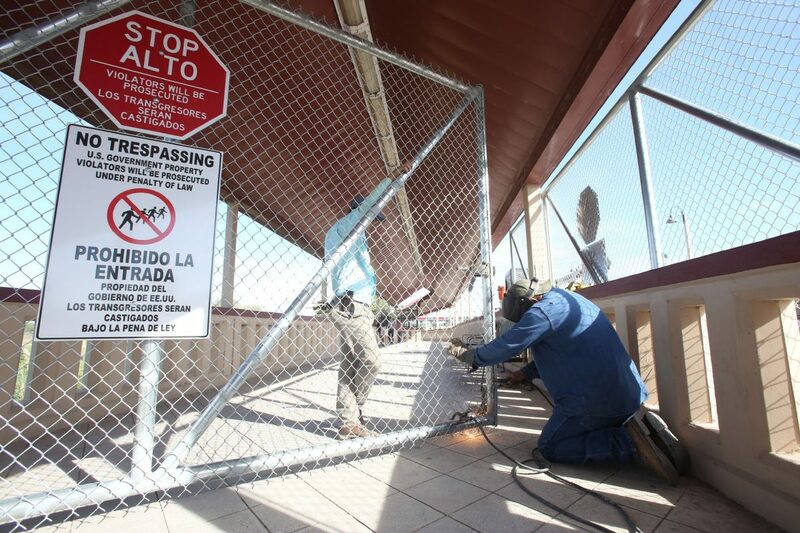 PROGRESO — As a contractor worked on soldering a fence in place on the pedestrian bridge in Progreso, a group of about six people waited to make their way into Mexico. They pulled their phones out and started taking pictures of the worker as he used his blow torch to melt the chain-link gate onto its foundation. The gate, which measures about 8 feet by 11 feet, appears to be one of several expected to be erected along the bridge — apparently in anticipation of a caravan of Central American immigrants making their way through Mexico and to the U.S.-Mexico border. It is not clear if the gate seen Tuesday would be the only one placed on the bridge that overlooks the Rio Grande. 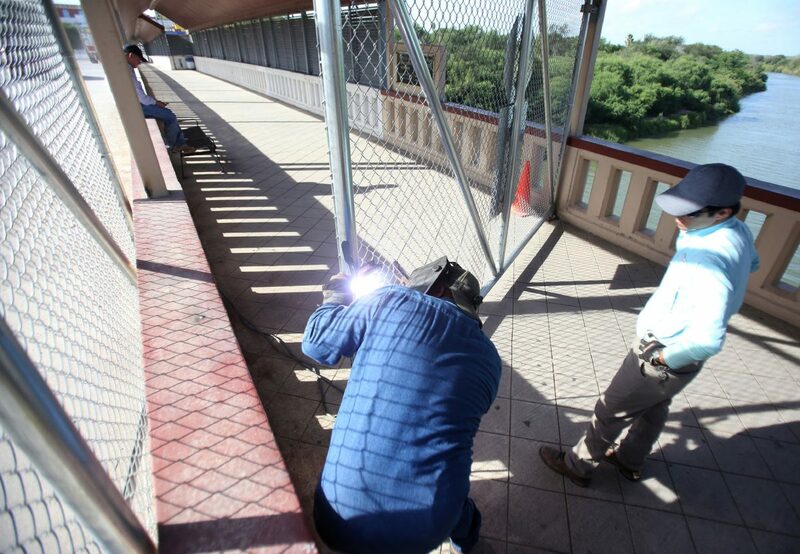 A crew works to solder fencing at the Progreso-Nuevo Progreso International Bridge Tuesday morning. The building of extra barriers around the ports of entry comes on the heels of the announcement from the Trump administration that more than 5,000 military personnel will be deployed along the southwest border to act as support for CBP officers and U.S. Border Patrol agents who protect the nation’s borders. At a joint press conference Monday, CBP Commissioner Kevin McAleenan and Air Force Gen. Terrence O’Shaughnessy, commander of the U.S. Northern Command, announced an additional 5,200 troops would be accompanying the already more than 2,000 National Guard positioned on the U.S.-Mexico border, saying border security is national security. “We will not allow a large group to enter the U.S. in an unlawful and unsafe manner,” McAleenan said Monday during the news conference. A message left for Progreso International Bridge Director Julie Ramirez was not returned as of press time. The email from CBP goes on to quote McAleenan from the aforementioned news conference. Even before the announcement, troops could be seen arriving in Brownsville at the Gateway International Bridge, while CBP officers wearing full riot gear conducted mock crowd control exercises in plain view. All this for a caravan that has dwindled down from more than 5,000 people to — by McAleenan’s estimate — just around 3,500, some of whom will likely seek asylum in Mexico while others may return home. It’s uncertain how many will ultimately reach the U.S.-Mexico border and where exactly they will end up. McAleenan made no specific mention of additional barriers at ports of entry, but said Department of Defense personnel would be helping with logistics as it pertains to border security. “…CBP has requested that DOD provide support in several key areas, significant air and ground transportation and logistics support to move CBP personnel and equipment to locations of operational focus, engineering capabilities and equipment to help ensure our ability to secure our legal crossings in key areas of the border, medical support units, mobile housing for sustaining CBP deployed personnel and extensive planning support,” he said. Officials said where the military troops would be positioned along the southwest border would be determined through collaboration between DOD personnel and CBP officials, who are continuing to track the caravan’s position. U.S. Reps. Filemon Vela, D-Brownsville, and Vicente Gonzalez, D-McAllen, criticized the president, saying the announcement and continued rhetoric aimed at the caravan as a “political ploy” to rile up his base of supporters a week before the midterm elections.